The physical heart muscle, fed by arteries, pumps and regulates the blood flow that carries oxygen and nutrients throughout our bodies. If we exercise that muscle through cardiovascular workouts and feed it healthy nutrients, it grows stronger. But let it languish and feed it toxins, and we all know what happens: the muscle grows weak and the arteries get clogged. Many of us have been hurt, suffered offense, and then lived with it unforgiven in our lives. All of my shame-filled brokenness and patterns of behavior were hurting my staff at Youth Alive, but I didn’t know it. Sometimes we have experienced so much abandonment and rejection that we choose flawed defense mechanisms to try to soothe those broken places in our lives. And sometimes we have damaged hearts and don’t even know why. When I was thirty-three years old, I discovered my brother and I were adopted. It was shocking. Surreal. Weeks later, when I saw my actual, original birth certificate, it stated I was “unnamed” and “unwanted.” You can read this story in my book Undaunted, but what I want you to think about now is how that affected me even though I was unaware of it for three decades. I had suffered from such rejection in my childhood — and it had been there from the beginning. Even before the beginning! Over time, I learned that my biological mother wasn’t married when she became pregnant with me — and conceiving a child out of wedlock was shameful for a Greek woman in the 1960s. So I was conceived in shame, left in a hospital in shame, and then adopted in shame. My adopted mom and dad suffered the shame of not being able to conceive… it was looked down upon culturally… so after years of trying, they adopted my older brother and me — and later were able to have my younger brother naturally. But because of social stigmas, they kept it hush about us older two. 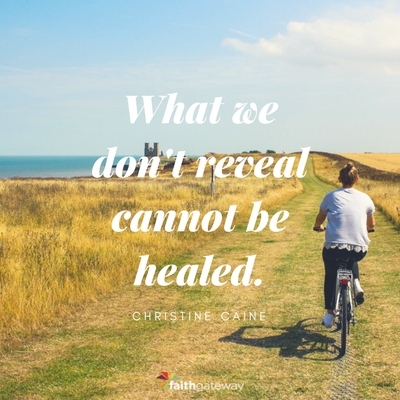 Yes, they loved us before we were born, and couldn’t wait until our birth mothers delivered so they could hold us and love us… but their shame and our shame — and my birth mother’s shame — all wrapped up together was more than a heart can process and be healthy. It can’t help but be damaged. I know what it is to find all sorts of toxins clogging my heart and pumping through my life. I was that way in my first years of faith. I had suffered so much abuse and carried so much shame that my heart was choked with perfectionism, unforgiveness, bitterness, guilt, and anger — and I was taking it out unknowingly on my team. When we carry toxins within us, no matter how hard we try, we still leak them, infecting those around us, ultimately destroying the relationships we value. When we’re bound by shame, we might not even realize that our reactions are shame-based. I knew that God had a great purpose and destiny for my life, and oh, how I wanted to step into that! When I began working hard in youth ministry, full steam ahead, I wanted to change lives and change the world for Jesus. But there was a disparity — a vast gap — between what I wanted to do and be and what was going on in my inner world. This, I believe, is where so many of us who suffer from shame get stuck in the wilderness! We feel that painful gap between what we know should be going on inside of us — love, forgiveness, kindness, joy, patience, peace, and so on — and what is actually going on inside of us — anger, blame, impatience, jealousy, turmoil, judgment, suspicion, and so on. I [decided to get] personal with God. I talked with Him about my scariest, ugliest thoughts, feelings, and memories. I chose to be vulnerable — something shame teaches us not to do — and seek counsel and accountability from seasoned, trustworthy mentors. When I did, God began to cut through my thick, hardened defense mechanisms. I began moving from deliverance to freedom in this area — from the wilderness to the promised land. But none of this was easy. It’s difficult to allow God to cut out defense mechanisms that have been clogging our hearts. After all, they have been a source of protection. We put them there for a purpose. I remember how at one point I tried to shut Nick out of my life, out of fear that no one could possibly love me if he or she knew how bad I was on the inside. How many times do we shut people out of our lives because our defense mechanisms are trying to protect our hearts? But as I allowed the Lord to heal my heart, my faith, strength, and courage rose. I turned from constantly trying to protect myself by controlling every detail of my life, to giving myself over to the Lord, bit by bit. A supernatural, divine exchange was occurring. God was replacing my clogged heart with His heart of flesh, because healthy hearts create healthy and fruitful lives (Ezekiel 36:26). Hurt people hurt people, but helped people help people. Broken people break people, but rebuilt people build people. Shattered people shatter people, but whole people restore people. Damaged people damage people, but loved people love people. Wounded people wound people, but healed people bind up wounds. Bound people bind people, but freed people lead others to freedom. My choice to allow God to change me then is a large reason why I am leading a global ministry now.